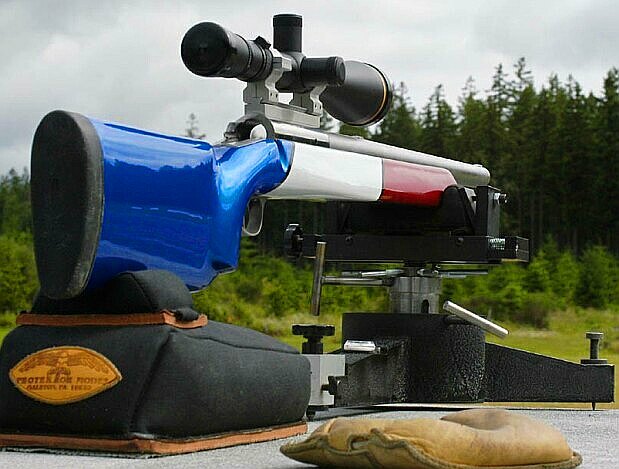 Most of us know by now that the diminutive 30BR is the cartridge to beat in benchrest score shooting at 100, 200 and even 300 yards. But when a 30BR aces out the “big boys” to set a new (pending) NBRSA World Record at 600 yards, that’s news. The marksman who pulled off this feat is Gene Solyntjes from Washington state. 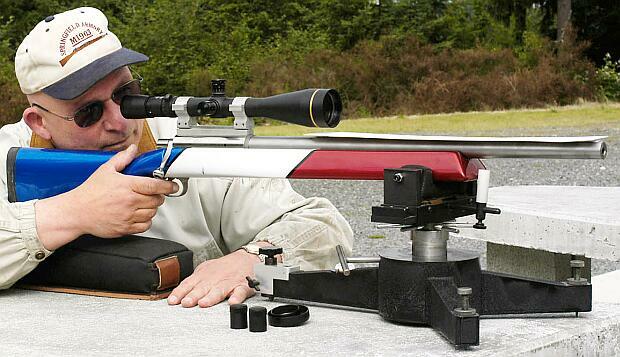 Shooting at the scenic Upper Nisqually Range in June, 2005, he posted a Ten-Shot, 100-5X Score (and 2.287″ group) that earned him a place in the record books. Gene’s rifle is a switch-barrel rig, so he can shoot both 30BR from 100-600 yards, and 6.5-284 at 600 yards and beyond. Gene tells us: “My rifle is a Hall ‘M’ action right bolt, left port switch-barrel rifle with HV taper barrels in 30BR (Pac-Nor 1 in 18), and 6.5 x .284 (Krieger 1 in 8.5). I chose this action because, at the time, it was the shortest, stiffest action that would feed and extract the 6.5 x 284 case. The action has a Jewell 1.5 oz. trigger and the stock is a Randy Dierks’ design from Action Gunworks. The custom, angled scope base was created by Rick Beginski, and Stolle rings hold a 30mm Leupold Premiere 18-40X scope with a fine dot reticle. The paint was applied in a patriotic theme of Candy Apple red, marble white, and cobalt blue by a patient of mine. Gene continued: “With stock issues resolved, my task was to adapt to the new 30BR cartridge and the new 6.5-284 barrel. I soon learned the both calibers performed great. Since this rifle returned from Greg Tannel it has won matches at 100, 200, and 300 yards, 500 meters, also 600 and 1,000 yards. Now that’s versatility. The 30BR worked so well, it took some getting used to, since nearly all the groups ever fired by the rifle at 100 yards have been of the single-hole variety. I quickly learned that, for me, the rifle responds better to being gripped, rather than free recoil. 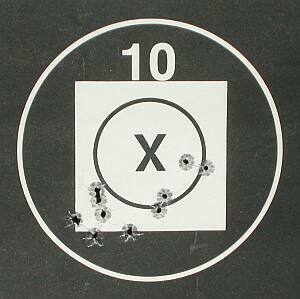 The smallest group fired at 100 yards was .341″ edge to edge. This was the hole at its widest diameter. The actual group size (center to center) was .033! The load that produced that bughole was 34.5 grains of H4198 SC ‘Extreme’, Federal match primers, with BIB bullets seated +0.030” into the lands. I use a sizing die converted from a 7 BR die by Jim Carstensen of JLC Precision. Prior to setting the Worlds’ Records, the most memorable day with the rifle was winning a point-blank match with over a dozen 6PPCs and BRs. The 30BR is capable of doing great things due to its Lapua case, ultra-accurate Robinett bullets, and the 17- or 18-twist barrels which work so very well. Gene explains: “I decided to go with a 30BR after consulting with Randy Robinett of BIB Bullets. Offering to help get ‘this project on the road’, Randy sent his reamer to Greg Tannel and rounded up a barrel from a large order placed with Pac-Nor. Early articles in Precision Shooting had left no doubt in my mind that a 30BR should be capable of superior, consistent accuracy and it should not be temperamental to tune. The major challenge with the 30BR is finding a better load than the one you are using already, since it’s so easy to tune! This is a very shooter-friendly, exceptionally accurate cartridge. For my long-range barrel, I chose the 6.5-284 because it’s becoming the most popular 1,000-yard cartridge and so much is known about its design and capabilities. Good loads are well-known. This case and the 142 grain Sierra BTHP is a tremendous combination, particularly if you sort the bullets for consistency. If there is anything I can share which will help readers it is the importance of precision bedding and stock-fitting. I sat behind a rifle on a bench a little over a year ago and returned it to battery. The crosshairs did not waver a bit. They returned to the same place every time. I was stunned. Rick Beginski then explained to me the bottom and side-flats of the stock had been trued to be exactly parallel to the bore’s centerline. Thus the rifle, with the bags set properly, would return consistently to the very same place. Over years I had battled this problem and suddenly here was the solution in my hands. With a rifle bedded this way, and a stock with straight, consistent dimensions, you can get off a fast shot string with amazing accuracy. Rick very carefully beds the action to ensure his guns track this consistently. I credit Ted Larsen’s tutoring when it comes to precision shooting and reloading. For years, Ted Larson held nearly every meaningful BR record at his home range and he was state champion several times. Ted was almost fixated in his attention to bullet jacket consistency, and the dimensional consistency of his turned necks. He also regarded neck length as his particular secret to consistent grouping. Ted preferred his necks to be just .003″ short of the OAL of the chamber. He felt that fouling tended to build up in the space between the end of the case neck and the sharp 90° end of the chamber, which affected the bullet before it even reached the throat. He kept his case necks very long to fill this gap, so no fouling could even build up in that area. This is one little detail I follow. I realize several respected shooters do really well at 600 yards with their 1,000-yard rigs shooting long boat-tail bullets pushed by a lot of powder. I can’t argue with their success. Personally, though, I think that a lot of shooters can benefit from looking at 600-yard shooting in terms of what works well at 300 yards, not 1,000 yards. I feel there is a definite demarcation at 600 yards and that flat-based bullets and smaller-capacity cases can do amazingly well at 600, though they can be mediocre (or worse) at 1K. 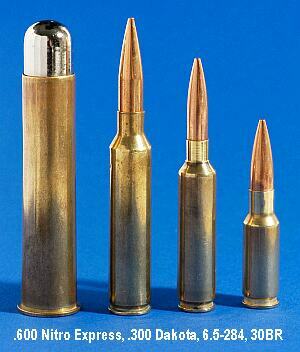 If some custom bullet makers ever come up with a really good medium-weight, flat-based 6.5 mm bullets, I wouldn’t be surprised to see a lot of shooters appear with 6.5 BR, 6.5 IMHSA (shortened .308s), and 6.5-308 chamberings at 600-yard matches. 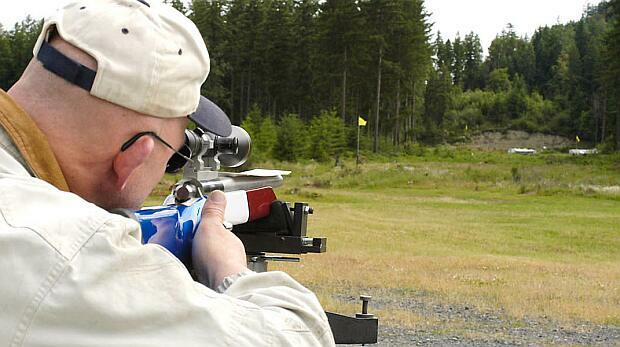 The Upper Nisqually Sportsmen’s Club (UNSC) range, nestled in Washington’s Cascade Mountains, is one of the most beautiful ranges in the world. With Mt. Rainier as a backdrop, matches are held all year round. At Upper Nisqually you don’t have to worry about gale force winds, extreme summer heat, or terrible winter blizzards. It’s truly a wonderful place to shoot for those who love the challenges of long-range competition. Built with true determination and dedication by Ron Baker and his helpers, UNSC’s 600-yard range is so new that the roof over the ten benches hasn’t even been built yet! Matches started in February and three NBRSA World records have been set and five others are pending in just this short time! While I feel honored to have shot two pending World Records at Upper Nisqually, I want to give credit to the others who broke records as well. Both the heavy and light gun agg records were set at the same meet. Billy Copelin set the heavy gun agg records of 3.670″ (60 shots) and 3.284 (120 shots). Ron Baker set the light gun agg record of 3.276″ (30 shots) at this meet. These two, along with Rick Beginski, form the nucleus of the outstanding shooters from this area. If you’re ever in this area, come visit–there are camping and lodging facilities nearby. Matches are regularly scheduled, and Rick Beginski, (425-349-5043) or Kevin Watson (253-847-1616) can provide match info. The UNSC website has directions to nearby Eatonville, WA, and to the range. Upper Nisqually’s reputation is growing as word of their “Ironman” BR competition spreads, a two-day shoot featuring ten-shot matches at BOTH 600 and 1,000 yards on each day.